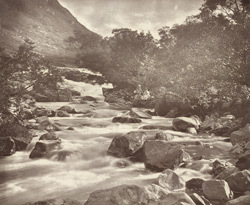 "The stream here depicted is on the Borrowdale side of the Stake Pass, descending the hillside towards Rosthwaithe. Swollen by heavy rains, it has become what the poet terms 'a raving stream,' rushing onward over black crags, through narrow chasms and rock-strewn ways, with a noise that almost drowns the wild music of the autumn wind among the faded woods, falling quickly from gradual slope to slope, with wild infracted course, until it reaches the level fields around Rosthwaite, and steals at length along the mazes of the quiet dale where it empties itself into the Derwent." Text by Stephen Thompson from his book 'Studies From Nature'.